Let us help you learn, advance and succeed! 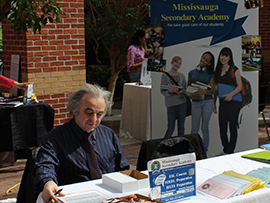 Mississauga Secondary Academy is now enrolling students for the Night School! Night School is the perfect option for those who are interested in completing or upgrading their high school courses in the evenings or weekends, or boosting your university or college applications. Call905-232-0672for more information or to set up an appointment with Guidance. 1. Mondays & Wednesdays - 4:30 to 8:30 PM. 2. Tuesdays & Thursdays - 4:30 to 8:30 PM. Standard Exam Preparation: GRE, GMAT, SAT, IELTS, or TOEFL exam preparation courses. All Grade 9 - 12 High School Classes are offered at our school. Please ask if the course you need does not appear on the above list. Our staff will be in contact with you to help you with all your night school inquiries in 1-2 business days. Why Do Students Choose Mississauga Secondary Academy? •MSA is aLicensed and Inspected Private High Schoolwith the Ontario Ministry of Education. *Promotion: While supplies last. Students are only eligible for the promotion if they are a new student and they have paid the course fee in full. We will be closed on all Statutory Holidays. Interested in our latest news ? Copyright 2012 - 2019 by Mississauga Secondary Academy Inc., All Rights Reserved.